Giving birth is one of the most vulnerable moments a woman can experience. 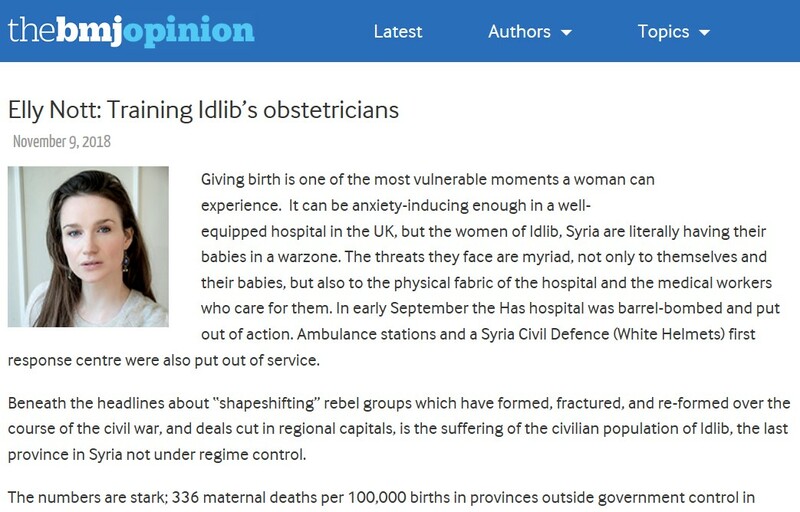 It can be anxiety-inducing enough in a well-equipped hospital in the UK, but the women of Idlib, Syria are literally having their babies in a warzone. The threats they face are myriad, not only to themselves and their babies, but also to the physical fabric of the hospital and the medical workers who care for them. In early September the Has hospital was barrel-bombed and put out of action. Ambulance stations and a Syria Civil Defence (White Helmets) first response centre were also put out of service. Beneath the headlines about “shapeshifting” rebel groups which have formed, fractured, and re-formed over the course of the civil war, and deals cut in regional capitals, is the suffering of the civilian population of Idlib, the last province in Syria not under regime control. Violence against hospitals and medical staff affects clinical decision-making. On 19 March 2018, the Union of Medical Care and Relief Organisations (UOSSM) reported that doctors in eastern Ghouta had, on the previous day, performed 15 caesarean sections out of a total of 30 births. The doctors said that they were being forced to do caesareans as the intense besiegement made it difficult for expecting mothers to predict when they could safely go to the hospital. The risk of complications for the mother and child are increased by the lack of incubators, medical equipment, and staff with the right training to perform follow up care. However, the war alone cannot explain the high levels of maternal and neonatal morbidity. There is a serious shortage of obstetricians and midwives to care for a population of some 3 million. This can lead to non-specialists having to undertake the care of pregnant women and neonates and sometimes not making the correct decision for the patient. While not all of that population of 3 million will be having children, of course, the pressure on health services has increased as much of that population is made up of internally displaced people from areas including eastern Aleppo, eastern Ghouta and Homs. The province has become a receptacle for the vanquished as the regime has hammered those opposed to Assad’s rule. Following relentless campaigns of bombing and the use of chemical weapons, those civilians left alive boarded buses for Idlib province. Farida and 17 other obstetricians were in Gaziantep recently for Systematic Management and Emergency Care in Obstetrics and Midwifery (SMEC-OM), a course organised and funded by the David Nott Foundation, Hand in Hand for Aid and Development, and World Vision International. The Syrian civil war has stalled the medical education of doctors and midwives, a further major contributing factor to the poor outcomes in obstetrics and gynaecology. Postpartum haemorrhage and eclampsia/pre-eclampsia were responsible for the majority of maternal deaths in areas of Syria not under government control in 2017. The SMEC-OM has been devised to save the lives of mothers and babies by training clinicians to use established algorithms and guidelines for managing conditions such as maternal collapse, post-partum haemorrhage, pre-eclampsia, sepsis, and neonate resuscitation. The Royal College of Obstetricians and Gynaecologists (RCOG) in London is supporting these efforts and the course is conducted under the auspices of its Syrian Liaison Group. Organising this essential training is Saladin Sawan, a British-Syrian gynaecologist. Saladin is joined by a faculty of trainers from several Arab states, all of whom give up their time for free. They lecture with authority and passion for their subject, inviting debate and questions from the doctors, 90% of whom are women. The energy in the room is palpable as they question graphs and diagrams and participate in practical exercises on specialist obstetric simulator models. What they learn is being measured by an exam comprising both a paper of multiple-choice questions and a practical assessment on a simulator. The candidates who perform most strongly in the assessment proceed to a “train the trainers” day, where they will be coached to provide help and supervision to their colleagues in Idlib. This is especially important as 35 candidates had registered to attend the training but only 18 were able to make it across the Turkish border. Getting the best in surgical training to those who need it most is the mission of the David Nott Foundation and we were proud to be able to support this thorough, detailed training. It is the focused effort of Abdulaziz, Saladin, and countless other individuals and charities that has created a shadow health system in areas of Syria not under government control. As the Syrian regime and its Russian supporters bombed hospitals and medical facilities, they scrambled to set up new ones underground and in caves. As the number of doctors shrank, they strove to train and upskill those who remained. Idlib is the final front in the Syrian civil war and it is uncertain whether the current ceasefire will hold. The diplomats and politicians negotiating Syria’s fate owe it to the obstetricians I met in Gaziantep, and the thousands of women and babies who depend on them, to come up with a solution which creates the peace, security and dignity they so greatly deserve.